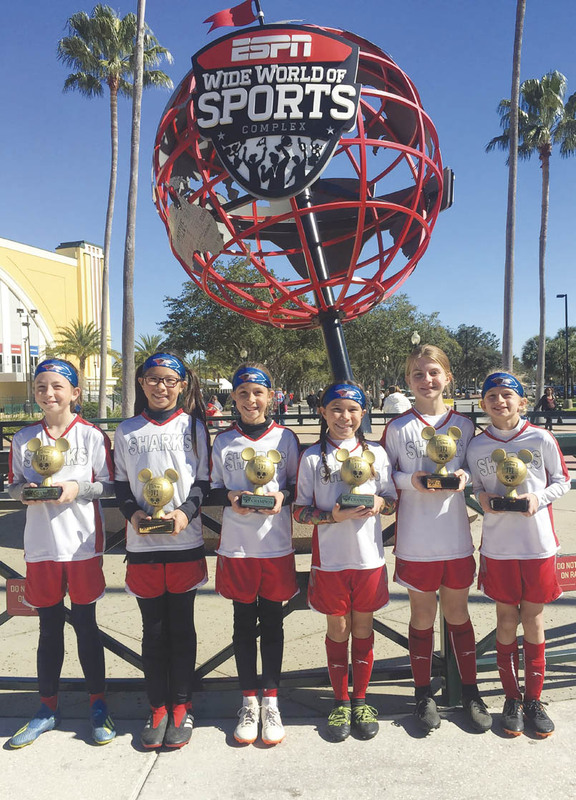 Members of the Lady Sharks 3v3 soccer team with their world championship trophies: Hannah Hanson (from left), Lilly Kham, Lilly Ahlers, Abby Rippy, Heidi Sanders and Everly O’Daniel. A team which included players from the 501 recently took home the top prize in the Disney 3v3 World Championships. Members of the team were Abby Rippy of Conway, Heidi Sanders of Little Rock, Lilly Ahlers of Hot Springs, and Hannah Hanson, Lilly Kham and Everly O’Daniel, all of Northwest Arkansas. Abby’s dad, Carl, is the “dedicated parent” for the 3v3 team, which plays in the U11 (Under 11) division. 3v3 soccer is played with smaller goals on a smaller field. It typically is more fast-paced and it is not unusual for a team to score seven or eight goals. “With 3v3, there are more chances to touch the ball and greater chances of scoring,” Carl said. Carl said 3v3 soccer has “gotten really big.” He said there is usually a 3v3 tournament every weekend in Arkansas or surrounding states during the summer. He said the Lady Sharks won quite a few tournaments and qualified in August for the Disney tournament, held in January in Orlando. The Lady Sharks went undefeated in the Disney tournament. “They were super excited,” Carl said, adding that the team plans to continue playing and hopes to make a return trip to the Disney tournament.